Preheat oven to 350 degrees F. Brown ground beef and mix in packet of taco seasoning. With mixer, mix French onion dip and cream cheese. In baking pan, put ground beef mixture as bottom layer. As second layer, put the dip/cream cheese mixture. 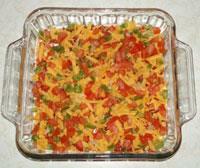 As top layer, sprinkle package of shredded cheese. Bake for 15-20 minutes. Sprinkle with chopped peppers, tomato, onions on top.